Thomas Robert Malthus is best remembered for his 1798 treatise titled An Essay on the Principle of Population as it Affects the Future Improvement of Society. In that work, he argued that because food production increased arithmetically and human population increased in a more rapid geometric manner, society would ultimately face dire consequences because of decreasing per capita food availability. Because of this thesis, economics has been coined "the dismal science." Detractors note that it is only a hypothesis and not a proven theory. Furthermore, they argue that human conditions since Malthus have improved in many ways due to technological innovation. The Malthusian hypothesis today remains influential in environmental thought because of its warning about unrestrained population growth. SEE ALSO E HRLICH , P AUL ; L IMITS TO G ROWTH ; P OPULATION ; T RAGEDY OF THE C OMMONS . 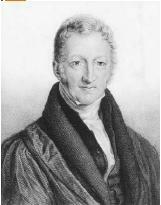 The International Society of Malthus Web site, edited by Ronald Bleier. Available from http://www.igc.org/desip/malthus .